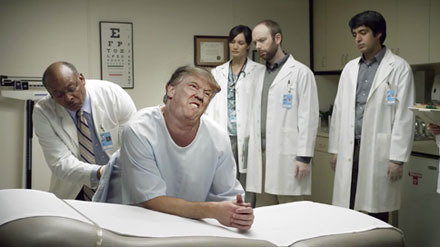 Our dear Prez gets his physical today. How will he fare compared to last years great report? Will he be able to name the animals on the mental test? is a Lion a Lion? Camel a Camel? Edited 1 time(s). Last edit at 02/08/2019 08:02AM by samintx. I'm sure he lost a few pounds. I wonder if they'll transpose the first two numbers in his weight again? Considering his last two 'physicals' were out and out fraud... should be interesting. I'd LOVE to see the results of his mental function tests. He grew another inch to keep his BMI rating below dangerously obese. his health will be greatly, bigly beautiful. just like coal.